From Monday, Nov. 19 to Friday, Nov. 23 the City is holding the fifth annual food drive to collect non-perishable food items in support of the Community Food Sharing Association. 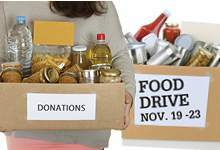 To participate, residents are asked to package non-perishable food items and place it outside the home, in a visible location near the road, by 8 a.m. on their garbage day. City staff will collect the donations beginning at 8 a.m. Residents in apartment buildings should ask their building manager to organize a collection area and to contact 311 (754-CITY) to arrange a pickup. Food items can also be dropped off at City Hall, the H.G.R. Mews Centre, Paul Reynolds Community Centre, or Southlands, Kilbride Lions and Shea Heights Community Centres. The daily tallies of food collected will be posted on social media using #nlfooddrive. Since the City of St. John's first food drive in 2014, residents have donated more than 450,000 pounds of non-perishable food to the Community Food Sharing Association.